This has been a long term project as I dismantled various phones in my collection. In each article I have commented on the mechanical, electrical and production design of each instrument. The comments represent my personal opinions and prejudices and not necessarily mainstream thinking. The main point is that there are plenty of pictures. 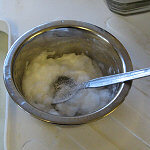 It wasn't intended to be a guide to restoration: I leave that advice to others. It's more like a Haynes® Manual with attitude. A post-liberalisation design commissioned by BT and a good example of how to keep production costs down without sacrificing quality. The last of the Post Office's pillar-type telephones. A late design that had a remarkably long service life. Solidly built, but difficult to replace the cords. Updated March 2008 with comments received from THG members. 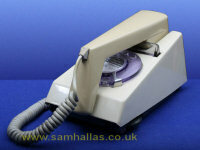 Based on the Siemens Neophone it superseded the candlestick, bringing handsets back into telephony. Revolutionary in appearance with its clean and smooth curves moulded entirely in Bakelite. Not strictly part of the Phone-to-bits project, but I did take it to bits. 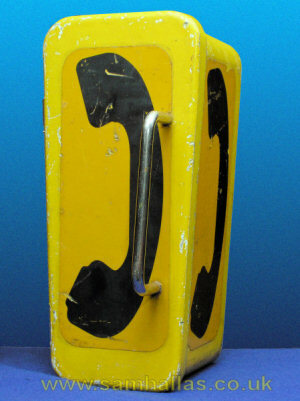 This is a modified version of the BPO Telephone No 745 weatherproof telephone for use with the Plessey Post-Hixon level crossing telephone system. Conceived as a luxury phone for the residential market, the trimphone remains a design classic from the 1960s. The final 'Let's take a telephone to bits' article covers the successor to the 706 and one of the Post Office's last non-electronic designs. It combined design improvements with a reduced cost. 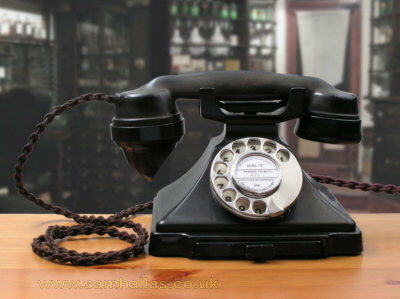 It goes on to look at the Telephone No 740 allowing four buttons and the Telephone No 741 wall-mounted version. A look at the handset through the ages. Starting with a classic Ericsson style from Dictograph in the 1920s. 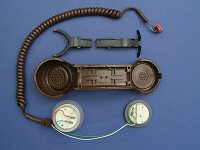 Following is the first British bakelite handset - Telephone No 164 - then into the plastic era with Handset No 3 & Handset No 16 and finally the innovative design of the trimphone handset.